I’m happy to announce a number of new features coming to caniuse, with the new site now available for preview at beta.caniuse.com. The features are built upon a complete rewrite of the site’s front end code, which will hopefully also lead to more improvements in the future. Until now the site had only been using the “Worldwide” dataset from StatCounter which was useful but could be quite different from the various geographic regions that many site owners are interested in targeting. You can now pick any of StatCounter’s regions to see the support value percentage based on that region. The data is always from the previous month, and will be automatically loaded when revisiting the site. 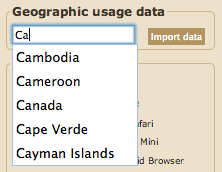 On a new month, regional data is automatically updated. Improved browser comparison with subsections for common/different usage. What about the new design? Quite some time ago it was announced that the site would implement a new design in cooperation with Lennart Schoors. While some parts of this design have been already incorporated, the overall design is not there yet. This was due to some architectural inconsistencies between the design and the new features where I opted to get out the new features first. The good news is that the new design is next on my list, once the new features have been put on the main site. My goal is it to have it implemented before the end of the year. 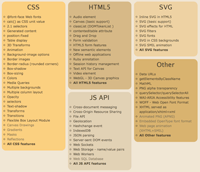 I hope you find the new caniuse.com features useful in your web development/design work. If something on the beta site’s not working right please file an issue (use “beta site” tag) so I can fix it before pushing the new features to the main site. Thanks! Big “When Can I Use” update! UPDATE: The Android 2.2 browser has now also been included. The most popular WCIU request has been to add tables for support for mobile web browsers. This is now available together with the desktop browsers, including for now: iOS (iPhone/iPad/iPod touch) browsers, Opera Mini, Opera Mobile and the Android browser. These are known to be the most popular mobile browsers, so I thought I’d start with them. You can view each type as a set by using the URL caniuse.com/#agents=desktop or caniuse.com/#agents=mobile. 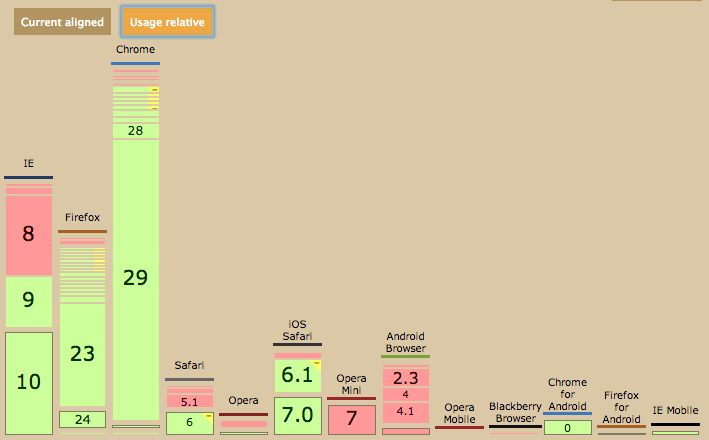 In the future more mobile browsers are likely to be added, with the grade A browsers on this chart having priority. If you’d like to know just what percentage of users can use a given feature, you can now get a rough idea from the “Global user stats” displayed in the upper-right hand corner of a feature. Of course your audience may be very different, so this should just be used as a guide. Mobile browser statistics are not currently included, but hopefully I can find some way to include them in the future. Each feature has its own non-hash URL now, (i.e. caniuse.com/webworkers) which is useful when sharing a feature table with others or looking up a feature quickly. These pages are designed to load quickly, with a link back to their interactive versions. This previously existing feature has now been improved: Type in your query directly after http://caniuse.com/ and you will be directed either to the related feature page or (if multiple results are found) to the search results page. For example, caniuse.com/corner will redirect you to the caniuse.com/border-radius page. A full overview of all features mentioned on WCIU listed by category is now available by clicking on the big “Index” tab. The same overview is available on each single feature page too. Each feature now includes a “Feedback” button, which you can use to quickly send me a correction/link suggestion, etc. Also, thanks to the site’s restructuring, I plan on adding many more features in the future. I have fixed a number of bugs related to the working of the option checkboxes and URL hash, so things should work more as you’d expect them to. A number of links/notes/descriptions have also been updated. I’ve also added a “Three versions back” era (hidden by default) in case you need to go back even further in time. So that’s it! The remaining request I’ve had is for a public API, which is something I’m still looking into but should be in my next big update. Enjoy the new features, and let me know if you run into any bugs or mistakes.